RIO DE JANEIRO — David Prince, who lost the lower half of his right leg in a motorcycle accident, was leaning over the rail at the Olympic Stadium, holding a running blade in his hand as the Paralympic competitors on the track lined up for the start of the race. It was the men’s 400-meter final for runners with leg deficiencies. 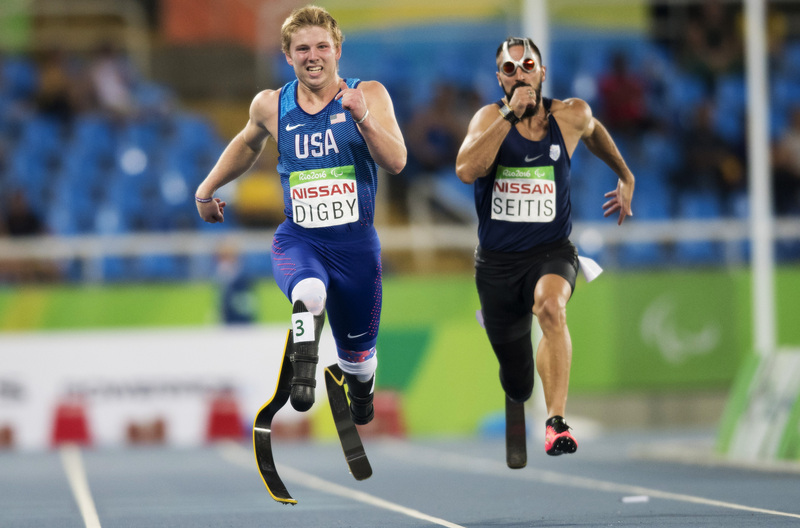 Eight competitors positioned themselves in the blocks, ready for the starting gun, but Prince had his eyes locked on Michail Seitis, a single amputee from Greece and a training partner. At the 2012 London Games, it was Prince in this race. He finished third behind Oscar Pistorius and Blake Leeper, an American counterpart. Both were double leg amputees. Prince still looks back fondly on that finish, but he knows that was four years ago, and much has changed. Just before the starting gun, Prince says to no one in particular that a record could fall today. And then the runners are off. Prince lets out a cheer for his friend Seitis, but he already knows how this one is going to end. As the runners bound into the final turn before the straightaway, five double leg amputees begin to overtake Seitis. His shot at glory is over, and Prince knows it. “Oh, to be a bilateral” he says. And yet, as Seitis crosses the line, the video display board lights up declaring a new Paralympic record. But it wasn’t from the new gold medalist. It was Seitis who set a new record for single leg amputees, finishing in sixth place behind five doubles, three full seconds off the bronze finisher with a time of 49.7 seconds. The scene begs the question, is it fair for single and double amputees to race against each other? And Prince isn’t afraid to ask it. If it feels like single leg amputee runners are becoming an endangered species among the Paralympic track community, it’s because they are. 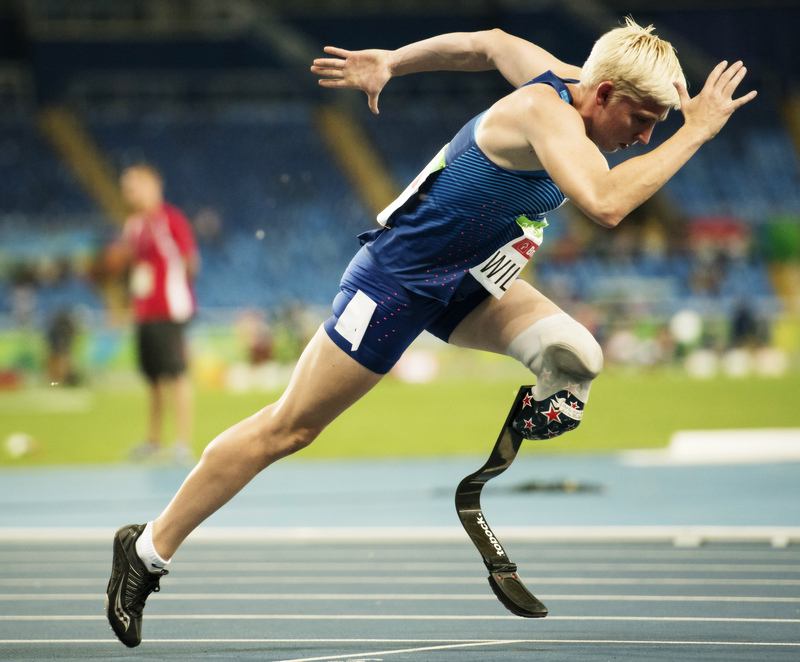 Of the eight competitors in the 400-meter final in Rio, only two were single leg amputees. The same was true for the 200-meter men’s final. The men’s 100-meter race was the only race that featured more single amputees — five — than doubles (three). This trend has been growing since the 2000 Paralympics. There, in Sydney, none of the competitors in the final races of the 100, 200 or 400 were double amputees. Four years later, there were only two bilaterals across the major final races. The number has steadily grown, to the point that now single amputees are shying away from the longer distance races, where their results have been steadily worsening. Sometimes better technology has created a gap between athletes within the same division — or classification, as it’s known at the Paralympics — who have distinctly different levels of disability, and perhaps nowhere is it more clear than with track. Even those with doctorate degrees have started to see what Prince is talking about. Gregor Wolbring, an associate professor in community rehabilitation and disability studies at the University of Calgary in Alberta, Canada, studies the Paralympics closely and has seen technology advance to a point where it is shifting the discussion. Prince encountered a similar situation to his friend Seitis this year in Rio when he ran in the men’s 200-meter final and finished in sixth behind five double amputees who all came in with 21-second marks, while Prince finished in 22 even. The developments are both exciting, and — to Prince — somewhat concerning. He has marveled as some accomplishments that were previously thought to be unattainable by any Paralympic athlete have been achieved. But he also worries that some athletes, such as single amputees like himself, will be left behind. The gap between the top finishers has increased over the past decade as double leg amputees have risen to prominence. The times of the gold medalists in the men’s 100-meter from 2000 to 2008 would not have won medals in the 2012 and 2016 games. Those margins are slim, though. In the 400-meter, the advances have been more drastic. In 2000, Neil Fuller, a single leg amputee, won gold in the 400 in a time of 52.3 seconds. That top number has fallen every year since, first by a second in 2004 and then sharply in 2008, when Pistorius, the first double amputee to take gold, finished in 47.5 seconds. Prince, the son of missionary parents, does not begrudge his double amputee competitors for availing themselves of whatever is within the rules. Craig Spence, spokesman for the IPC, said the Rio Games have shown him an increased level of athletic performance. However, he was hesitant to attribute all of it to advances in technology. Training for disabled athletes also is improving. Spence said the only stipulation in terms of access to blades or any other piece of technology is that it must be available on the public market. Prices for running blades vary, but the top-of-the-line options can reach tens of thousands of dollars. Prince said he has had conversations with members of the IPC about figuring out competition between single amputees and double amputees. The main question that Prince is concerned with is whether double amputees and single amputees should compete against each other at all. “Last year and this year were really hard for me to stay motivated to actually continue training, because I go into the race knowing that [double amputees] run faster times and I know I’ll get beat,” Prince said. With the number of competitors using the top blades on the market larger than ever, and many of those being under the age 25, what could happen over the next four years is a sharp drop-off in the number of single amputees competing in events against bilaterals, the 33-year-old Prince said. The empirical data, as Prince alluded to, has not been conclusive enough to draw a conclusion by the IPC — single leg amputees are still winning, albeit at a lower rate — but there is a ring of truth to his crusade. 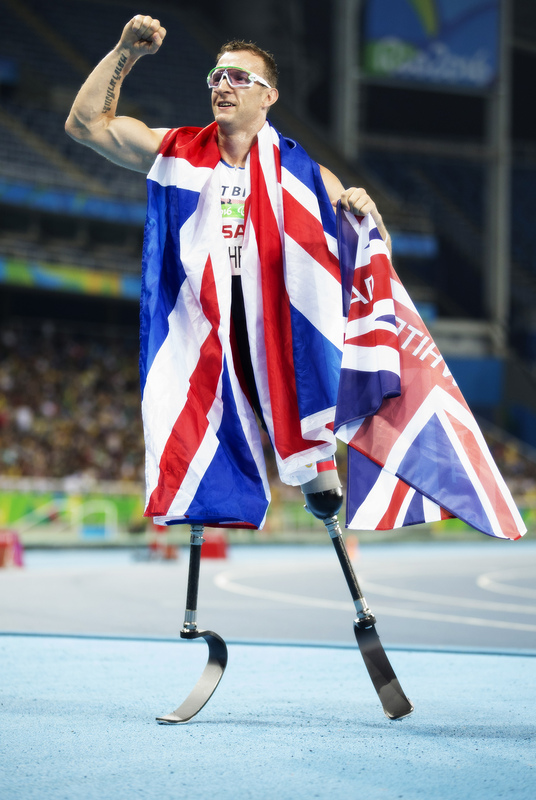 Consider this: Jonnie Peacock, of Great Britain, won the men’s 100 meter final in Rio as a single amputee. However, Liam Malone, a double amputee from New Zealand, started out of the blocks slow but roared back to finish just behind Peacock in second. Had there been another 10 meters, Malone most likely would have closed the gap as, with each stride, his longer-than-legs blades made up the ground. There are more cases like this. In 2012, single amputees swept the medal stand for the 100-meter race. But just behind those three was Pistorius, who missed the bronze by 0.1 seconds. And in the 200 and 400, five of the six total medalists were double amputees — Prince was the only single amputee competitor to medal, capturing that bronze. On the other hand, there are cases like the men’s 100-meter final in 2008. The field featured seven single amputees and one double. That double? Pistorius, who took first place. In fact, Pistorius went on to take gold in the 200 and 400 as well. Ian Brittain, a research fellow at Coventry University who has studied the Paralympics extensively, wrote a book titled “The Paralympic Games Explained.” In it, he explored some of the challenges that Pistorius brought about for the sporting world at large. “The fear then, in the case of Pistorius, for the IOC and the IAAF, was not the usual prejudice most people with disabilities have encountered at some point in their lives of being considered ‘less than human’, but in fact the complete opposite – the fear of being ‘more than human,’” Brittain wrote. This idea is a line that the Paralympic community has towed as recent as the months before the Rio Games. In July, Channel 4 in Great Britain released an advertisement that billed the Paralympic athletes as “superhumans.” The TV spot was met with an outpouring of support from the public. It has more than 7.5 million views on YouTube. Wolbring said that technological advances have always been present in the Paralympics, but it took some “new facets” for people to realize there was a potential threat to competition. We are reaching a point where “techno-doping” must be addressed, he said. So while it may have been Pistorius who provided the spark for the conversation about the capabilities of double leg amputees, the issue had been simmering for a while. Now, the way Prince sees it, that technological threat is pushing single leg amputees like him off the track. Should the trend continue, well that would be a shame, he feels, and would go against the spirit of the Paralympics. He’d like to see single and double leg amputees each compete in their own division. “In order for the sport to stay legitimate, something has to be done.